This tall guy walks up to me. He is sharp dressed, looks strong, and his eyes exude confidence. Nothing ever gets into his way, and the word “failure” is simply not part of his vocabulary. “So, Gerrit, tell me, what are your goals?”, he asks in his sonorous voice. A smart question which obviously does not leave any room for me not having any goals. My goal is to help other people be more successful in their jobs and live better lives. And I want a happy and fulfilling life for myself. I want to be in control of my time and spend my time with the people that matter to me. I can’t put a number on that. I got fed up with goal setting in my corporate job years ago. Goals mattered more than anything else. It took at least the first two months of each year until management concluded the annual goals. I was part of this management. Meanwhile the people doing the real work (e.g. on night shift in my factory) simply did their best without having any S.M.A.R.T. goals on EBIT, ROI, or quality metrics. When we achieved the goals (which were relevant for the variable part of a manager’s income), we celebrated and patted ourselves on the back. When we missed the goals, we found brilliant excuses like the general economic downturn, the latest financial crisis (there is always one somewhere), or an earthquake. If having goals works for you, that’s great; keep using goals. If you feel it doesn’t, don’t worry. You don’t have to have goals. 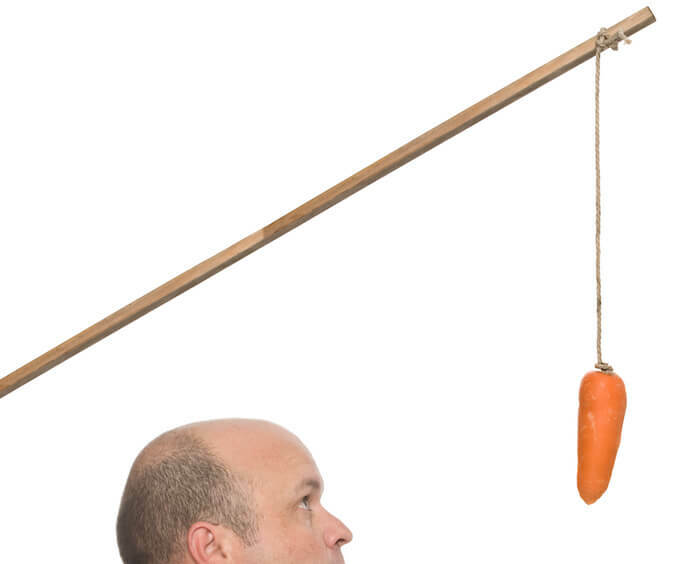 In fact I have seen too many people running after their goals like the donkey after the carrot in front of the cart. These goals remained continuously this tiny little bit out of reach. Over time, this gets very frustrating. Maybe a certain cash flow, EBIT, or ROI are required to keep your company in the business. Such goals may be a necessity. I won’t argue with that. Maybe reducing your bodyweight to 75 kg is a reasonable goal for you. Or having this Vice President title on your business card within 18 months. Or increasing your salary by 20,000 $ next year. Will achieving these goals make you happy or fulfilled? Only you will know. I just doubt it. And that’s why direction (and the clarity about it) matters so much more than having “SMART” goals for every area of your life. Direction is the overruling idea what you want to do with your life; it’s your compass, your value and believe system. It’s about what really matters to you and what defines you as a unique person. The direction maybe your aspiration for a healthy lifestyle, a fulfilling job, and a happy family life. It’s solely up to you if you need to define S.M.A.R.T. goals to get there. Whether putting a number on your weight, counting the hours you spend with your loved ones, or measuring your professional success by the figure on your monthly pay-check helps you, only you will know. It’s not up to other people to try to define the word success for you. Learn again to trust your intuition. Stop over-rationalizing everything, let your instinct guide you, and simply do more of what makes you happy. Don’t let other people tell you what you have to do if it does not resonate with you.